As we inch closer to the one-year anniversary of President Donald Trump’s inauguration doubts persist within the pundit class about Trump’s relationship with members of Congress. Everyone knows the president’s tangled mightily with Democrats throughout those first twelve months, the most recent dust-up coming over Trump’s alleged “sh—hole countries” remark made during a meeting with senators from both parties at the White House last week. Trump denies ever making the comment and Georgia Republican Senator David Purdue backed up Trump’s claim to ABC News’ liberal George Stephanopoulos last Sunday. Regardless of Trump’s word usage he’d face a near impossible task in trying to mend fences with the Democrats. But there are also those who suggest Trump has a ways to go to shore up good feelings with his fellow Republicans too. If recent history is a guide, Trump’s attempting to do just that. Sarah Westwood of the Washington Examiner wrote, “Republicans who once questioned President Trump’s competence or called him a ‘jackass’ have spent recent weeks singing his praises and joining him on Air Force One as the president works to repair strained relationships on Capitol Hill ahead of the midterms. “Facing the prospect of a Democratic wave in November, the White House and GOP lawmakers have already begun to bridge their past differences in preparation for the political battle they will fight together over the next 10 months. Add the fact Senator Purdue and Kentucky Senator Rand Paul went on TV last weekend to defend Trump over the “sh—hole” controversy and you’re getting the impression that all’s well in Republican-land. It’s common knowledge Mitch McConnell seems to be thrilled with Trump lately – and why shouldn’t he be? For a president who’s been widely criticized for a reluctance to jump into the fights over legislation in Congress (especially on Obamacare repeal) Trump is all-but taking the lead in the immigration/federal budget battle with Democrats. Whenever the news media and Democrats throw a fit over a single word Trump uttered it means a lot less negative energy is going towards those in Congress who are doing the real negotiating with the opposition over a DACA “deal” and increasing immigration enforcement. Put another way, if Trump is receiving all of the enemy’s “fire” it covers for the guys setting up the mortars to lob the shells that really count. Diversionary tactics are what Trump does best and he’s “covering” for men like Purdue & Paul in their efforts to hammer out something palatable to conservatives. But is this really overstating the problem? While it’s true Trump has tussled with certain establishment Republican members of Congress, on the whole they’ve gotten along very well. Except for a few big bumps in the road, numerous critiques of Trump’s Twitter habit and a personal clash or three they’ve all managed to make it work in Trump’s first year. Graham and Paul were former presidential primary rivals of Trump’s so they’ve felt the lash of criticism directly – and much of it has been very personal. Trump hits back hard when he sees a threat and there’s no mystery involved with the president’s reactions when certain members of Congress questioned his mental stability as Corker repeatedly has. Arizona Senator Jeff Flake similarly attacked Trump as being unfit and made a name for himself as one of Trump’s main Republican adversaries. Could Flake be setting himself up for a 2020 presidential primary challenge? Don’t laugh – it actually sounds plausible. Cheryl K. Chumley wrote at the Washington Times, “Jeff Flake, who’s retiring from the Senate at the end of his term, is obviously positioning himself to be the Republican challenger to President Donald Trump in 2020. His platform? Like the Democrats, it’s simply this: I detest Trump. “Yes, he’s gearing for a run, all right. Think about it. He’s got the right amount of name recognition among the establishment. He’s got the anti-Trump book, anti-Trump media messaging and no doubt, anti-Trump bumper stickers being printed as we speak. Chumley includes quotes from Flake uttering the standard “It’s not in my plans. But I’m not willing to rule it out” noncommittal wishy-washy nonsense about a future run so typical among #NeverTrumpers who savage the president at every opportunity yet still vote with him over 90 % of the time. A cursory look at the issues Flake disagrees with Trump reveals they mostly concern foreign policy (such as sanctions on Russia) which indicates the retiring Arizona senator firmly resides in the warmongering neoconservative camp. It should also come as no surprise that Nebraska #NeverTrump Senator Ben Sasse’s record is practically identical to Flake’s, meaning Sasse votes with Trump nearly 90% of the time and most often disagrees on foreign policy matters. Despite these minute ideological differences Trump’s critics usually take issue with the “tone” of Trump himself and his administration. Word choice is what these folks have the biggest problems with as well as the fact Trump’s pre-politics character was less than admirable. Heck, many conservatives – myself included – took issue with Trump’s background yet his performance as president has been very reassuring. The Trump who descended the steps of the Capitol Building to take the oath of office a year ago is largely the same one who resides in the White House today but the #NeverTrump faction still can’t get over the hump and jump on the bandwagon rather than kick it as it goes by. Chumley pointed out Flake’s home state approval rating was so low he couldn’t hope to win reelection to his senate seat and it was this fact -- not some principled “I can’t work with this man” stance -- that led to the senator’s decision to bail out. Now Flake’s talking about possibly challenging Trump in the 2020 GOP primaries. If he’s going to do it he’ll need to get in line behind John Kasich and probably some member of the Bush family – or maybe even Mitt Romney. Romney was critical of Trump again over the non-existent “sh—hole” comment and by all appearances is dead-set on running for Utah’s open senate seat. The GOP establishment is hankering for Mitt’s presence in Washington, apparently. Alexander Bolton of The Hill reported the other day, “Senate Republicans are eager for Mitt Romney to succeed retiring Sen. Orrin Hatch (R-Utah), with some hoping he will emerge as an independent counterweight to President Trump. “The midterm election is shaping up as a referendum on Trump’s first two years in office — a dynamic that could endanger GOP control of the Senate, given that the president’s approval rating has hovered around 35 percent. Bolton holds up Jeff Flake as an example of a colleague who’s eager to have Romney in Washington though obviously Flake himself won’t be in the senate next year to greet the 2012 presidential loser should Mitt run and win. Flake and another anonymous Republican (in Bolton’s story) are all-but guaranteeing Romney is planning to run and predicting he’ll immediately enjoy a more elevated stature than a typical freshman senator because of the former party nominee’s dominant national profile. In addition it almost looks like Mormon politicians have a particular vendetta against Trump. It’s no secret Mormons as a group weren’t wild about the New York real estate mogul’s candidacy from the beginning. Mormons tend to be more liberal than other Republicans on the immigration question and they purportedly object to Trump’s non-presidential demeanor more strenuously as well. Jeff Flake is Mormon and so is 2016 “independent conservative” Evan McMullin who won over 20% of the vote in Utah on Election Day. Romney and Flake and the other Trump-bashers can whine all they want but at the end of the day the Republican Party has moved on from their amnesty-supporting illegal immigration views and Trump’s America First foreign policy orientation appeals to a winning electoral coalition. Constitutionally speaking the executive sets national security policy and while the senate has an advisory role it’s the man in the Oval Office who gets final say on most matters other than treaties. Even if successful Mitt Romney will be confined to seeking out friendly interviewers (shouldn’t be hard unless he starts saying nice things about Trump) and getting only a token mention or two on the evening news when he commits a gaffe. Or maybe Mitt could make headlines by being the first Republican to openly embrace fellow Senator Chelsey Manning. Katie Leach reported in the Washington Examiner, “Chelsea Manning has filed to run for U.S. Senate as a Democrat in Maryland, according to a Federal Election Commission filing. “Manning, a transgender former Army private, was sentenced to 35 years in a military prison after being convicted in 2013 of leaking classified documents. She was released from prison after the sentence was commuted during former President Barack Obama’s last year in office. In doing so Manning will challenge Democrat Sen. Ben Cardin in the party’s Maryland primary; one can only imagine what his/her issue platform will be. In other words Republicans and Donald Trump aren’t the only ones who have relationships to repair. The media will blow any potential intraparty GOP differences way out of proportion. 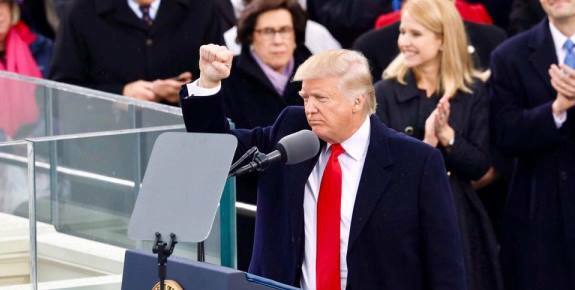 A year after President Trump was inaugurated the establishment is on the run and the party is largely unified.